Indonesian President Joko Widodo, right, delivers a speech with running mate Ma'ruf Amin during a televised presidential candidates debate in Jakarta, Indonesia, April 13, 2019. President Joko "Jokowi" Widodo, facing Gen. Prabowo Subianto in a rematch, is widely expected to win a second term when Indonesians go to the polls Wednesday. Indonesian presidential candidate Prabowo Subianto, left, with running mate Sandiaga Uno, prays prior to a televised presidential candidates debate in Jakarta, Indonesia, April 13, 2019. Indonesian presidential candidate Joko Widodo speaks to supporters during a campaign rally at Gelora Bung Karno Stadium in Jakarta, Indonesia, April 13, 2019. 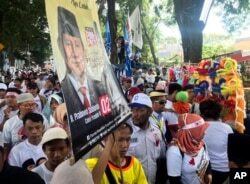 Supporters hold a banner showing support for presidential candidate Prabowo Subianto during a campaign rally in Tangerang, Indonesia, April 13, 2019.